Though production wrapped a few months ago, director J.J. Abrams’ sequel to his stellar 2009 reboot Star Trek has been unsurprisingly shrouded in a heavy veil of secrecy. We know literally nothing about the plot, we haven’t seen any official images, and we still don’t know for sure what baddie Benedict Cumberbatch is playing. With the film’s May release date looming closer and the holiday movie season getting ready to begin, we’re likely to have a better idea of what to expect fairly soon. It’s fitting that today, the 46th anniversary of Star Trek: The Original Series, we get our first big major reveal from the film: it’s title. Apparently Abrams’ heretofore-untitled Star Trek sequel will hit theaters as a colonless Star Trek Into Darkness. Hit the jump for more. 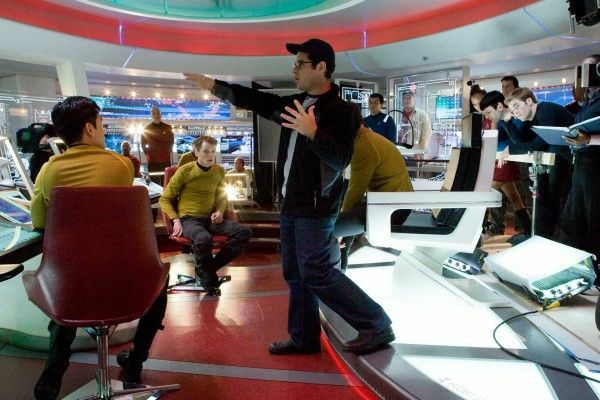 Through much debate and discussion among the film’s creative team, TrekMovie has confirmed with multiple sources that Star Trek Into Darkness is the title that Abrams and co. have settled on. The absence of a colon in the title is by design, but it feels a bit off for the Star Trek franchise. It doesn’t exactly roll off the tounge as easily as, say, Star Trek II: The Wrath of Khan, or even Addams Family Values. At the end of the day, though, it’s just a title and it has little to do with the actual quality of the film. However, this reveal does hint at some rather dire circumstances that may surround the central plot of the follow-up. Cumberbatch is one hell of an actor, and if said darkness refers to the threat he poses against the crew of the Enterprise then it’s not a stretch to believe that Kirk, Spock, etc. are in for some trouble. Apparently the creative team is still figuring out exactly how to officially unveil this title, but it’s expected to occur soon. We’ll likely get a teaser poster of some sort to announce the impending darkness, and I wouldn’t be surprised if we saw the first trailer attached to Paramount’s December actioner Jack Reacher or November’s Flight. Until then, sound off in the comments with your thoughts on the follow-up’s title and how it may figure into the film’s story. Click here to catch up on all of our previous coverage. Star Trek Into Darkness opens in 3D on May 17th, 2013.